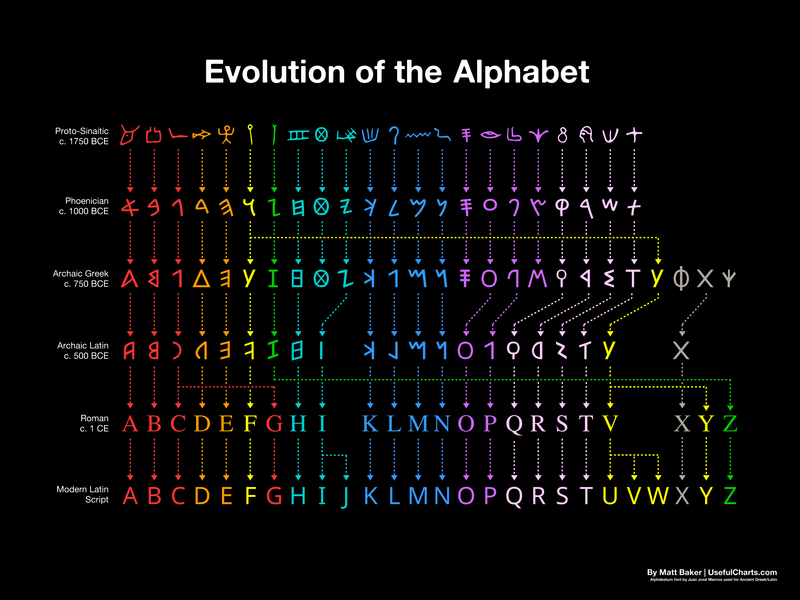 Found this amazing chart on the history of the English (or Latin) alphabet, made by Matt Baker. You can download the hi-res color version here. The ampersand (&) used to be part of the alphabet, right at the end. It was pronounced like ‘x, y, z and per se and’ so is where we get ampersand from. Thorn (þ) isn’t on the chart anywhere either. It was part of the Old English alphabet and was pronounced like ‘th’, but because it looks like ‘y’, when the printing presses arrived in England from Europe, they didn’t have the þ symbol, so they used Y instead as it was close enough. When you see spellings like ‘Ye old Fish and Chip Shop’ in England, the ‘Ye’ is meant to be pronounced like ‘The‘. Psyche – ψυχή, means ‘soul’ – not ‘mind’ as we may assume! The letter “Z” was re-introduced into the Latin alphabet c. 1st century B.C. by the Romans in order to capture the Greek letter zeta. They did tack it back onto the end, which explain Z’s current position. This predates both the modern printing press and even the invention of moveable type by several centuries. The letter that looks like a Z in the Archaic Greek alphabet is the letter yod, which used to have a “y” sound but gradually morphed into an “i” sound (pronounced “ee”) and became the Latin I. Before the Romans it was not uncommon for writing to be done in “Boustrophedon” or “ox-turning” style, ie the first line went left-right, the second line right-left etc (like the path of an ox ploughing a field). Not only was the direction of the words reversed, but the letters were also flipped. It wasn’t so much that the Romans flipped them, they just settled on one of the two versions of each letter that were available. After Greeks adopted the phoenician letters they flipped them perhaps because phoenicians wrote from right to left and Greeks wrote from left to right. Of course there is also the weird “Boustrophedon” way that was only used for a few hundred years. The letters used in Classical Greece is shown here. As you see in this, it shows the letters in their new “correct” orientation that was used later on. “W” literally meant “double U”, or rather “double V” since at one time V and U were the same letter that diverged as pronunciations changed. For my book, I’ve been looking into the history of alphabetization. The major work in the field seems to be Lloyd W. Daly’s Contributions to a History of Alphabetization in Antiquity and the Middle Ages, written in 1967. It’s a short work of intense scholarship bring a huge breadth of knowledge to bear on a tiny sliver of a topic…like using the Hubble telescope to help you pull out a splinter. Lots of fun. The first catalog of a distributed library system. Cool! For my purposes, I’m struck by scattered examples Daly gives of early alphabetical lists that leave blanks for later entries. The earliest alphabetized list he found dates to the 3rd century BCE on the Greek isle of Cos where 150 names are inscribed in stone. The names are broken into three lists, and each is alphabetized. One of them leaves blanks, presumably for names to be filled in later. (p. 44-6). He also refers to papyrus rolls from the 1st Century BCE in Egypt that kept track of the various tax payments individuals made. Since the entries were updated throughout the year, the ledgers had to leave blank space for each person. At the end of the year, some of the more active individuals’ spaces would be crowded with entries, and other individuals would have lots of white space. (p. 44-6). That’s the limitation that space and time impose when you are stuck organizing your information in the physical world. The great French encyclopedia of the 17th Century hit exactly the same limit. Enlightening the World, by Philipp Blom, points out that the editors had to decide ahead of time what all the entries and cross-references would be since they were creating the Encyclopedia as a series of volumes, published over time, in alphabetical order. Imagine if Jimmy Wales had had to specify all topics and links in order to get Wikipedia built? Hah! Disclaimer: Before you start following these rules in the office, it’s a good idea to double-check with your employer about the alphabetizing rules followed in your company. There are different versions of filing rules so filing practices differ from company to company. It’s important for every business to have their employee information, company records, and other important data maintained in a proper and systematic manner. The way most companies do this is by alphabetization. The process has quite a few benefits as well. For instance, having a standardized filing practice means documents will be easier to find, you can add or remove new entries without disturbing other entries, and alphabetization is an intuitive process so people other than employees can understand it as well. Letter by letter: In this version, spaces between the words are disregarded. Word by word: Here, each word is filed on the basis of the first letter. Unit by unit: Here, each word, abbreviation, and initial is considered as a separate unit. Numbers go first. Arabic numbers (0-9) are indexed numerically before alphabetic characters. However, keep in mind that they are NOT spelled out. For instance, 21 Horses Inc. will come before 4 Horsemen Pvt Ltd. because we disregard the t and f in twenty and four respectively. You’ll file numbers in the same way you would file alphabets – in ascending order – that is, smallest to largest. If the numbers are spelled out, they’ll be treated as normal words and filed alphabetically. Initials are considered separate units and are also filed alphabetically. So, if you have to file J.K. Smith and K. Nyugen, J.K. Smith would be filed first. But what if the initials are same, like this: J.K. Smith and J.K. Nyugen. In this case, J. K. Nyugen will go first because we are looking at each letter (including the initials) by their designation. That means if the first letter of their surnames were same as well, we would then look at the second letter in their surname. So by that logic, J.K. Night would come before J.K. Nyugen. How does one treat hyphenated names? It’s pretty simple – you treat hyphenated names as one unit. Whether it’s the first name, middle name or the surname that is hyphenated, it will be treated as one unit. However, the symbol in this case (the hyphen) is not considered a separate symbol and should be ignored. Articles are words that describe the noun. In the English language, there are three articles: the, a, and an. You must ignore these while alphabetizing. Example: When alphabetizing A Face and The Arm, The Arm will become before A Face. Make sure you do not confuse the article “a” with an initial. FYI: You can ignore articles when alphabetizing a list using the alphabetizer. When symbols are part of a unit such as a name, they are spelled out. So $ is seen as Dollar and ! is seen as Exclamation Mark. Alphabetize them as you would normal words. Interested about learning more about how alphabetization works? Check out our article on History of Alphabetization. Why do we need to alphabetize? Even in our modern digital age, alphabetization plays an important role in our every day lives. From looking up a contact on our iPhone, to finding a CD in a music store, (they still have those?) knowing your letters is a valuable skill that isn’t headed for obsolescence any time soon! In the first stage of learning to alphabetize, children who are already familiar with the alphabet will practice putting letters in order. Typically this is done with tiles or flash cards that contain every letter of the alphabet. Children are asked to put the tiles in order, or are asked to put the letter down which follows a particular letter, by reciting the ABC’s and figuring out which letter is appropriate. Once the child becomes confident organizing the letters of the alphabet, they will be able to learn to alphabetize words. This can be done by putting words on pieces of paper or flash cards and pointing out the first letter of each word. Then those letters can be circled and compared to other words and sorted accordingly. Having the alphabet on-hand can also be useful in case the child forgets the order of letters. At this stage, students will be presented with words that begin with the same first two, three or four letters. They will be asked to compare the words until they find differences in the lettering and to determine which of the differing letters come first and and which position in the word they occur. At the more advanced levels, students can learn to compare surnames with unique capitalization, how to sort a list of titles by ignoring articles, and other advanced rules for alphabetization. Alphabetizing is still an important skill, so work with your children on it. Who knows when an electromagnetic pulse will permanently disable all our electronics and we’ll be back to doing things the old way! And be sure to check out The Alphabetizer for help with all your sorting needs! The Alphabetizer Puts any List in Alphabetical Order! Well, after theunderwhelming number of cries for a blog for The Alphabetizer, I’ve decided to begin. Truly, nobody really cares whether The Alphabetizer has a blog or not. Unfortunately, to stay abreast of the SEO game, we’ll I’ll need to waste some time every week writing pointless keyword-packed articles about alphabetizing, alphabetization, sorting lists, sorting by last name, and perhaps some tutorials on how to sort in Excel and sort in Microsoft Word. As always, if you need to simply alphabetize a list, you can use The Alphabetizer at https://alphabetizer.flap.tv. God help us all. And to our search engine overlords…keep scraping by.